That’s right! For all of today (Sydney time) – midnight until 11.59pm or 9pm Sunday until 8.59pm tonight, Stampin’ Up! is covering the shipping on your order. You can order online (the host code is: K3RDKZAT) or you can contact me and I’ll place an order on you behalf. You can add anything to your cart and the final cost will be just your product total. How awesome is that??? There’s no minimum or maximum spend. So it’s a great chance to get those things you keep forgetting to order, or go nuts on your wishlist. If you’re looking for inspiration for things to add to that shopping cart, the Stampin’ Up! 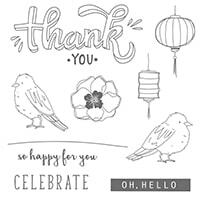 world is loving the new Stampin’ Blends. See more info about them in yesterday’s ESAD blog hop. Today I’m sharing the kit they’ve released to coordinate with the Blends – 16 cards in 4 designs that are perfect for colouring, with deluxe matching envelopes! 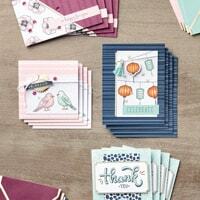 The card kit and clear stamp set is only $66.50 (with free shipping today!). Great value – yes??? Beautiful colours – yes!!! This is one of my favourite kits ever! And if something is your favourite, you want to see lots of it – yes? 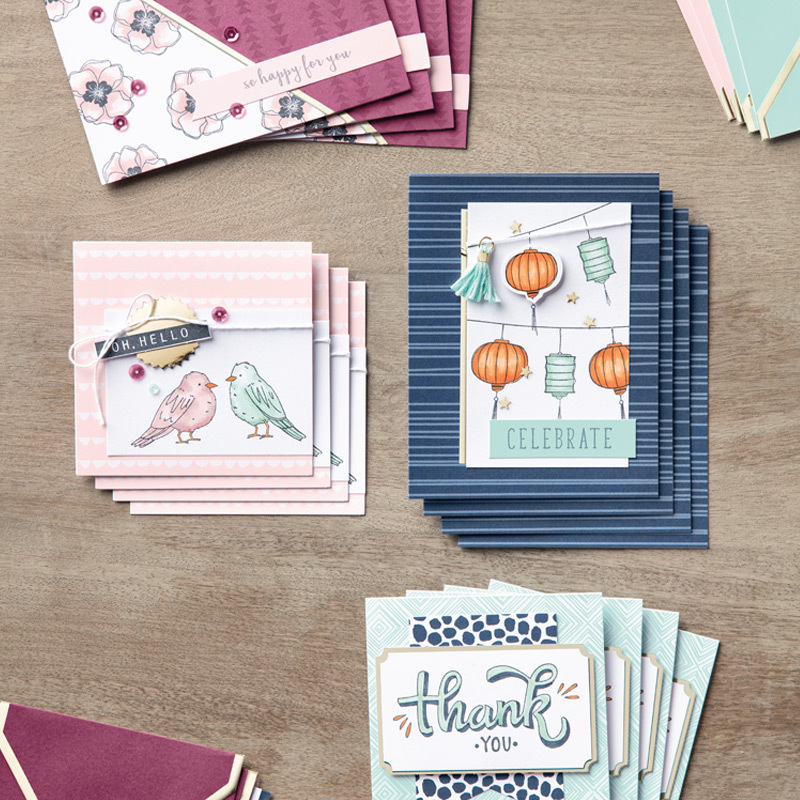 Stampin’ Up!’s kits are made with premium materials including card bases that are printed all the way across. Without altering them, this means you get colour on the front & the back of the card. So, I cut the based up, added them with some of the supplies I already have in my stash to create two cards instead of one for each design. And since you get 4 of each card type, I ended up with 8 of each design and 36 cards in total. Of course, this adds a bit of cost to the overall supplies used – but really, it’s coloured cardstock bases, Whisper White for stamping and some scraps of other coordinating colours. Essentially, the cards are now twice as economical. And at just over $2.50 each, they weren’t that expensive to start with anyway! 8 of these cards are the square design in the kit, but when I changed up those designs, I added the square card base I’d cut to a full size coloured base – giving me 8 more full size cards. 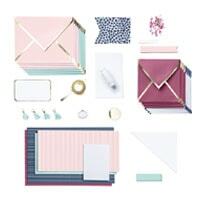 You could make all the cards full size if you didn’t like square cards (but then you wouldn’t get to use the ah-may-zing envelopes!!!). If you’re tempted to add some (or all) of the Stampin’ Blends to your order, or anything else on your wishlist, today is the day! Free shipping til 8.59pm WA time tonight (11.59pm – EDST / Sydney time). Visit my online store by clicking here. The host code is: K3RDKZAT. Or contact me direct so I can place an order for you.